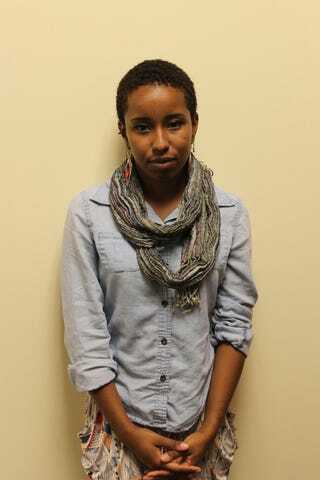 BART police arrest, assault young woman for riding train while black. Details are emerging about a March incident in which BART police wrongfully arrested a young black woman and her friends for dancing on a train. On March 21, police responded to a complaint about young people dancing on a train and soliciting money. Officers arrested Nubia Bowe, 19, and two of her friends, after a witness identified the two friends as the dancers who were causing a disturbance. Multiple train riders told the police the trio was not responsible for the supposed disturbance, and the witness who singled out Bowe's friends later recanted. "slammed to the ground, handcuffed and accused of resisting arrest, among other charges. When she reached the county jail at Santa Rita, [Bowe] says officers beat her for allegedly attacking one of the guards, and she was put in restraints, similar to a straight jacket. She was placed in a wrap which had handcuffs attached and a belt connecting her upper body to her ankles." Bowe eventually spent four nights in jail at $120,000 bond on multiple charges, including resisting arrest. Moreover, due to the arrest, she was kicked out of a job training program two months before she was set to graduate. A pre-trial hearing for the first of the charges against Bowe is scheduled for May 19. Bowe's family has started the One Shot Away Coalition to inform others about Nubia's case and to spread awareness about police brutality against people of color. Nubia Bowe's arrest happened just two months after BART police were caught on video tasering and using excessive force against a black man on a BART train. Top image of Bowe via postnewsgroup.com. H/T to Groupthink user wheretobegin for the story.